At A1 Services we like to install the best boilers, Vaillant are the market leaders and produce an extensive range to suit your needs. Whether you are replacing an old central heating system or installing a brand new one, the team at A1 can provide you with an installation service that really is second to none. Here at A1 Services Oxford our engineers are on hand to assist you with any plumbing issues you are facing. From a new boiler to central heating installations, we’ve always got you covered. Our company was first established in 1967 and have spent the past few years developing an excellent reputation. Additionally, we cover a large area across Oxfordshire including Wallingford. To find out more about the services we provide for our clients, please feel free to give us a call today on 01235 812 999. Some modern boilers can be up to 96% efficient, saving you money and improving the environment around us. Below are some examples of the testimonials that we have received in the past. 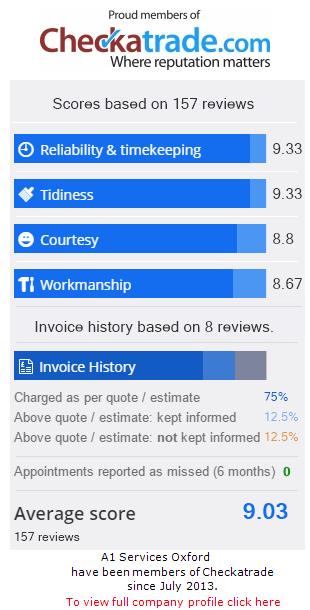 For more, please feel free to visit our Checkatrade page. ‘Called into the shop on Brasenose road, Didcot, to enquire about a new shower, they had the one I wanted in stock and fitted it the same day! Also cured a leaking toilet cistern at the same time. I asked about fitting replacement taps in the bathroom, selected the taps from their showroom catalogue and arranged a date the following week to have them installed. The town of Wallingford has a population of around 11,500 and is within the county of Oxfordshire. There is a lot of heritage here and the town was once known for having 14 churches. Today only 3 of these ancient buildings exist. For those visiting the area, there are plenty of places to explore. These include Wallingford Castle, the local museum, and the popular Island Farm Donkey Sanctuary. Our services are available across this area, wherever you are located. If you require any further details about our central heating installations available, please do not hesitate to get in contact. We are available to work across the Wallingford area and are willing to travel further if needed.